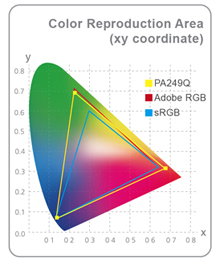 The ASUS PA249Q is pre-calibrated at the factory for the highest accuracy and outstanding color space reproduction – 99% Adobe RGB, 100% sRGB, and 120%* NTSC. 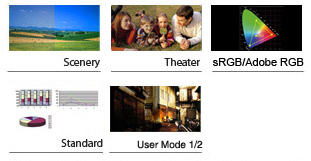 With a wide color gamut of 99% Adobe RGB, the colors seen in photos will be reproduced faithfully and consistently in a way that cannot otherwise be on monitors with just an sRGB color space. 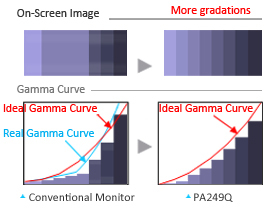 The PA249Q offers 10-bit display color for over one billion onscreen colors and support 12 bit internal lookup table (LUT), which gives smoother gradations and a more natural transition between hues. 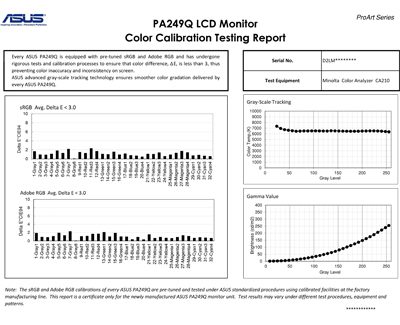 Each PA249Q guarantees industry-leading color accuracy, having been pre-calibrated to minimize the color difference to Delta E (∆E) of less than 3 – ensuring precise reading of color input and guarantees excellent color fidelity. The ASUS PA249Q features AH-IPS (Advanced High-Performance In-Plane Switching) display technology for superior color accuracy, a brighter image from increased backlight transmission and lower power consumption. 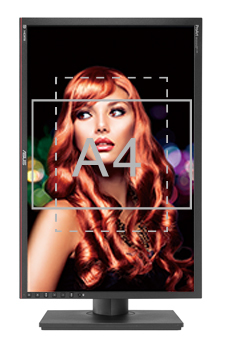 Each PA249Q also features a brightness rated at 350cd/m² and an 80,000,000:1 ASUS Smart Contrast Ratio for enhanced image contrast. 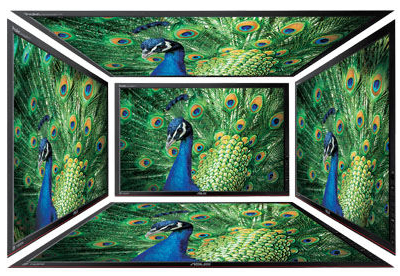 PA249Q uses a 178° (H)/ 178° (V) ultra-wide viewing angles AH-IPS display that eliminates color shift from almost any direction. The PA249Q comes with four USB 3.0 ports, users an easily plug in their devices and experience ultra-fast data transmission speeds that are up to 10 times that of current USB 2.0 standards. 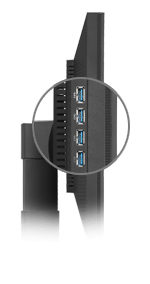 An extensive array of connectivity and high compatibility options are available with the PA249Q, including DisplayPort, HDMI, DVI, and D-sub; the PA249Q also allows users to use up to two or three displays simultaneously. The PA249Q has a 5-way navigation key that acts as a joystick that gives access to the QuickFit Virtual Scale function along with all OSD functions and settings. The PA249Q also features two user-customizable shortcuts for frequently used monitor controls, removing the need to navigate the full on-screen menu system. ASUS included its exclusive QuickFit Virtual Scale Function with the PA249Q, allowing users to preview photos and documents on screen in their actual sizes prior to printing. It can activated via a hotkey on monitor and used as a guide to accurately view and edit photos. 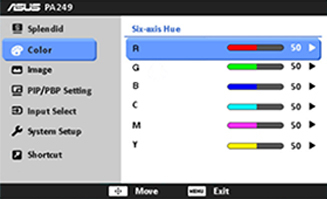 Additionally, the PA249Q also comes with a choice of seven different background colors for users to choose from. 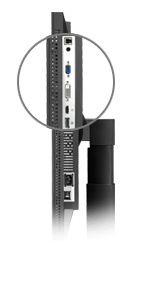 As with most ASUS displays, the PA249Q has an ergonomic design, with tilt, swivel, pivot and height adjustment give users a comfortable viewing experience. Its design has garnered accolades at the 2012 Good Design Awards and 2013 CES Innovation Awards.